Our "Go Gliding Day" provides the student with a training glider and instructor for a day. This allows for some one-on-one personal tuition that can reflect the abilities of the student. It also provides the opportunity for the student to immerse themselves in club operations and get a feel for what it's like to be a member. We find that by having intensive training sessions, students will learn much more from the instructor than would be possible through normal club attendance. By the end of the day you can expect to be doing most of the flying yourself. 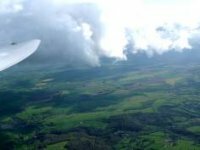 For a beginner to gliding the 'Introduction to Gliding' Course immerses you in the gliding world. The day consists of briefings and flying instruction covering areas such as airfield safety, effects of controls and primary gliding exercises. The student can expect 6 winch launches or equivalent in soaring time as well as being involved in all aspects of the ground operation. The Introduction to Gliding course provides the student with the opportunity to understand more about gliding and the instructor is available to brief on any desired areas and answer the student's questions. Your trip will start with a briefing by one of our fully qualified flying instructors who will explain all of the safety aspects of your flights and also introduce you to the aircraft and make sure you are comfortable. The glider will then be winch launched to a height of up to 2000 feet from where you really can get a bird's eye view of the Cotswolds; an area of outstanding natural beauty. Flight duration will be dependent on weather conditions on the day. Please note that we book up to two people at a time on the course but this does not impact on your allocation of flying. If you are less than 7 stone (45kg) or more than 15.5 stone (100kg), you may not be able to fly. Also very tall people, more than 6ft 3ins, may have difficulty fitting into the cockpit. Alcohol For legal and safety reasons you must not fly if you have more than 20 milligrams of alcohol per 100 millilitres of blood (a quarter of the amount for the UK drink drive laws). This is effectively a zero limit. Please check with our office if you believe you may have a condition that will be problematic. For insurance purposes, please notify us if you are over 70 years old. Event takes place at Aston Down in Gloucestershire .